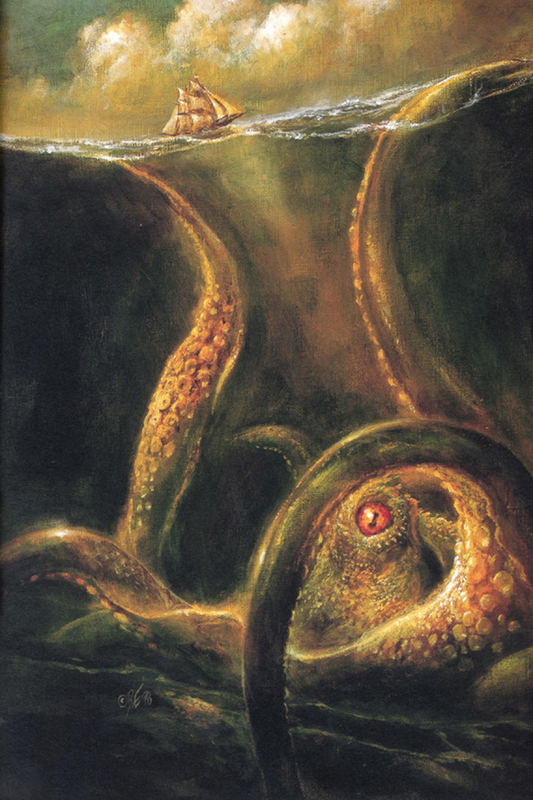 However, there are less apocalyptic tales about the Kraken – in particular about the ‘young Kraken’ – that contradict this, suggesting something on a lesser scale than the Midgard Serpent, though still scary enough. In the mid, I8th century Erik Ludvigsen Pontoppidan (1698-1764), Bishop of Bergen, tackled the long and hazy tradition of the Kraken in his Natural History of Norway (1752-1753). After scrupulously interviewing mariners he came up with this remarkable tale, which repeated a tradition that can be traced back to the 12th century but is certainly much older. Fishermen told Erik Pontoppidan that sometimes when they rowed several miles out to sea, particularly on hot, calm summer days, they found that in areas where they were used to sounding a depth of 80-100 fathoms (50-60m), they would find it registering less than half this. If the fish were also jumping, the fisherman guessed that the Kraken was lurking below, stirring them up. So, while keeping a careful watch on their depth, lines, the men would gratefully catch fish until the monster showed signs of rising to the surface. Then they would haul in their nets and paddle for their lives. Presumably he meant there were legends of ships and sailors being attacked, but that this was rare and never occurred in the circumstances he describes above. He personally heard only one close anecdote: two unwary fishermen suddenly ran into a ‘young Kraken’, one of whose ‘horns’ or tentacles ‘crushed the head of the boat, so that it was with great difficulty they saved their lives on the wreck, though the weather was as calm as possible’. Writing as he was in the Age of Enlightenment, Pontoppidan was laughed to scorn by many naturalists who thought he had fallen for a bunch of fishermen’s yarns. About the only part of his report seriously was his mention of the ‘young Kraken’. This creature was well known to Norwegian fishermen; to judge by their descriptions, ‘young Kraken’ are quite clearly ordinary squid. But, although evidence was then emerging that squid could grow much larger than previously imagined, the suggestion that one might have a circumference of over a mile remained outrageous. Some rationalists suggested – as in other cases of supposed monsters surfacing at sea – that what the fishermen were talking about, in a garbled and fanciful way, was simply the surfacing of weed tangles, buoyed up by the gases of their own decomposition. But most people simply laughed the tales away. Proof of a kind that Pontoppidan’s sailors may not have been exaggerating came in a curious way during the Second World War. While hunting for German submarines off the coast of Norway, ships of the US Navy found a strange conundrum. Sometimes in areas where they knew the depth to be over 150 fathoms (90m) their sonar would indicate a much lower figure. Closer investigation showed that this phantom layer would rise gently towards the surface at night, then sink during the day. This suggested some kind of dense blanket of living organisms maintaining temperature by adjusting their depth. The phenomenon is still unresolved but a reasonable suggestion is that it was probably caused by large schools of squid fanning out all at the same depth. And, if such a shoal surfaced, it might well appear, as Pontoppidan wrote, ‘like a number of small islands, surrounded with something that floats and fluctuates like seaweeds’. So is the Kraken in the end no more than a large school of squid breaking the surface? Well, possibly, squid are continuing to surprise us by the size they can reach. One wonders, too, about the phantom submarines which both sides chased occasionally in Scandinavian waters during the Cold War. Perhaps squid may indeed reach a size still not fully appreciated by either science or the world in general, and thus be the true Kraken. Next: Andy Cotgreave rearranges 7,596 circles into a Kraken engulfing an orange submarine.